crew, know how and equipment to do the job right. Our Crew will do a layout of your existing furniture, then mark each pew and each part of the pew to insure everything goes back where it came from. Next we completely disassemble the pews, load them on our trucks and take them back to our factory. 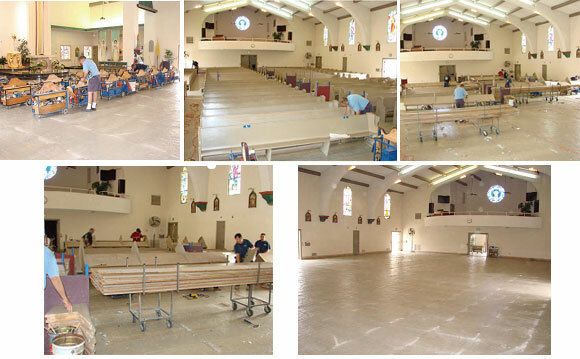 The final shot in this sequence shows the Church completely cleared out ready for the paint and floor crew. After the FACTORY Refurbishment of the Wood Parts and the Factory Sand Down and Refinish as well as Factory upholstery, we return with the Finished Pews, set up the Parts, Assemble, Line Up and Install the Completed Job. Here, our Chapel Crafters put the finishing touches on the Re-Installation of this Churches Newly Factory Re-Furbished 50 year old Pews. We do not ask the Church to provide any Labor. We do all the work, Manufacture, Deliver, Unload, Assemble, Line Up and INSTALL with our own Crews. 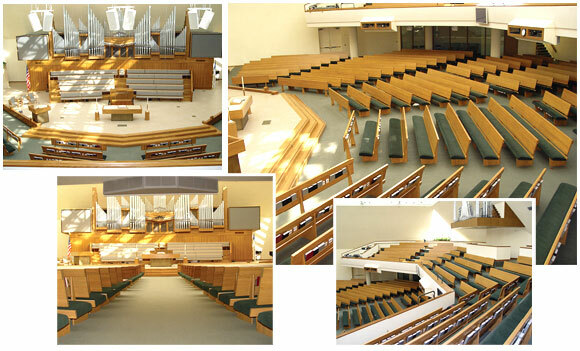 Cardinal Church Furniture’s Chapel Crafters Performed a Complete Factory Refurbishment on this project. Disassembly, Removal to our FACTORY in AZUSA CA. Complete Sand Down to the BARE WOOD, Re Stain, Seal and Lacquer. Removal of the old Fabric – and old Poly, then application of New Poly and Complete Factory Re Upholstery. Redelivery, Assembly and Reinstallation. 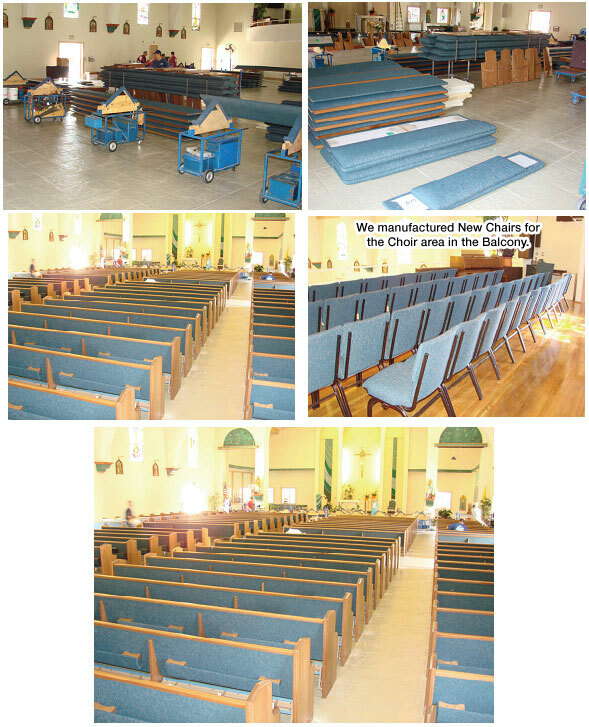 Photos below are after complete factory re-Upholstery & Re-Finish with all new choir seating.